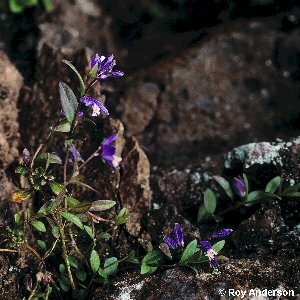 In Northern Ireland this is actually more common than the similar-looking so-called common milkwort (P. vulgaris). It is found in acid heaths and dry acid grassland. Flowers are blue or pink. The lowest leaves are oppositely arranged, but those higher up are alternate. All names: Polygala serpyllifolia Hose; Polygala serpyllacea Weihe; Polygala depressa Wender.